There’s no reason you can’t have the smile you want. With a combination of preventive care and restorative techniques, you can achieve a beautiful smile. We want you to look good, and looking good often means feeling good too! Modern dentistry techniques are quicker and easier than you may think, and very affordable. Come in and let us discuss how veneers, bonding, crowns, dental implants, and whitening can change your smile. A New Smile in Only Two Visits! Perhaps you think that the appearance of your teeth is beyond correction. Don’t let unsightly gaps, deep discoloration, or misshapen teeth lead you to believe you can’t achieve an attractive smile. In as little as two visits, we can change these problems with porcelain veneers. They alter your smile and look as though you have had years of straightening. Our veneers are very thin yet very durable advanced dental ceramic. They create uniform, straight teeth for a beautiful smile. They also work well for chipped or worn teeth. They conceal the problem, and the color of the veneer will match the shade of surrounding teeth. 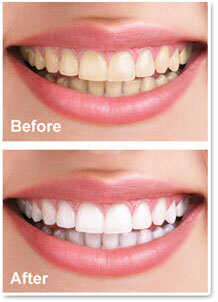 Whiter, Brighter Teeth in Just One Visit! Teeth appear healthy when they are their whitest. At our practice we offer patients Opalescence® whitening, which produces results 33% faster with much less sensitivity than other methods. Come into our office with dull teeth and leave with dazzling, brilliant white teeth. We also make custom whitening trays, produced in our in-house lab. With the instructions and supplies we provide, you complete the procedure at home. With this safe and effective treatment, you will see the results you desire within 1 – 14 days. The silver-mercury filling has been the standard material used by dental practices for many years, but they aren’t the most effective restoration. Composite resin fillings strengthen tooth structure and are made to match the shade of the tooth. Many patients don’t like a dark filling that’s very noticeable and unattractive when smiling or speaking. Metal fillings also do not bond well to a natural tooth structure, increasing the risk of decay setting in around or under the filling. Composite fillings add to the attractiveness of your smile while helping to prevent the onset of cavity development. Schedule a complimentary consultation by calling 763-972-2800, and discover how cosmetic solutions and teeth whitening can give you a brilliant new smile!